This FanDuel review is meant to give you an inside look at one of the most successful daily fantasy sites in history and provide the information you need to determine if this is the right site for you. FanDuel is one of the two giants in the daily fantasy sports industry. FanDuel has millions of paid users and some of the largest contests in one day fantasy sports. FD will pay out over $2 Billion in 2015! What so many users and insanely large prize pools, there is ample availability of huge fields for guaranteed prize pool (GPP) contests and monster prize pools. Daily fantasy gamers like yourself can find the perfect contest that fits your requirements. The partnership they announced with the NBA in November should help with continued growth to the number of users gaming on FanDuel. The site offers daily fantasy games for the NFL, MLB, NBA, NHL, NCAA basketball and football. The contest types include head-to-head games, leagues, 50/50s and tournaments. During the first 6 weeks of the past NFL season, FD offered a $2 million first place prize and $10 million total prize pool in one Fantasy Football Championship weekend. Large prize pools aren't limited to the NFL, either. FD offered a $1 million prize pool in multiple NBA contests this year, too, and their Daily Fantasy Baseball Championship will pay $1 million to the winner. FanDuel has achieved impressive press coverage with accolades pouring in from the likes of Fox Sports, NY Times, SI, Yahoo! Sports and WSJ. While NFL fantasy football is their largest draw, FD also offers games in every major sport including basketball, baseball and hockey. With the launch of their iphone and android app, playing from any mobile device is a breeze. Playing on FanDuel.com is legal in the US and Canada only. FD also offers a 100% money back guarantee on your first $5 or $10 game. So, you can try out their game offerings with no risk! The buy-ins for contests range from free to $10,000 according to their entry fee search bar. The cheapest entry fee for a non-free contest is $1. The wide variety of buy-in price points caters to gamers of all income statuses. Furthermore, most of the largest GPPs offer cheap satellites for entry. The wide array of games and buy-ins make FD a great site for daily gamers to play at. The process of becoming a FanDuel gamer is simple. 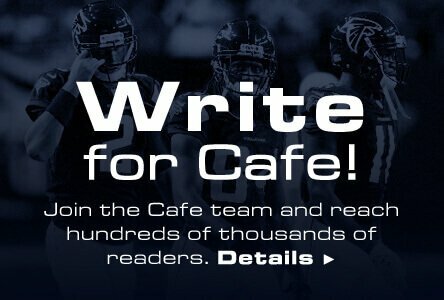 It begins with signup at fanduel.com. After signing up, FD makes depositing easy. Whether you're playing for real cash or becoming familiar with the site, selecting a contest from their main page is the next order of business. Once you've selected a contest, the fun begins. At this point you'll be drafting your team. After selecting your team it's just a matter of waiting to win -- or hopefully win at least -- your contests. When you're ready to withdraw some of your winnings, FD makes it simple like everything else. Below, I'll go into further detail about each step. When you reach the landing page, you'll see a large Join Now button in blue. Click on that button to complete signup in a matter of seconds. If you click through our links, you'll gain 5 free NFL game contests over the first five weeks of the NFL season. When we analyze DFS website, we look for ease of use, quality design and intuitive behavior. FanDuel.com satisfies many of our criteria and the signup process is no different. It's a fast process that doesn't give you a headache and solely covers the essentials. The only update we would recommend is displaying the promo code box without having to make an additional click. We don't like extra work of clicking a link and the promo code box is a critical elements in the signup process. Many players signup due to the introductory offer. Save users a click and display the box. Unlike any other daily fantasy site, our FanDuel promo code offer is guaranteed to be the highest possible offer. We have the full FanDuel promo code fact sheet you help you take advantage of the offer. The minimum deposit is $10, and deposits can be made using credit card (Visa, MasterCard, Discover) or using your PayPal account. FanDuel was one of the latest daily fantasy sites to add on a single game format. This comes across all the major sports, but football holds the most volume. The roster makes up of FLEX spots, which means you can play any position. This gives you some flexibility, and you are able to add more strategy to differ from the field. The main twist within this format is the MVP spot, that gives you 1.5x fantasy points. NBA goes a step further. They have an MVP spot that gets 2x points, a STAR spot that gets 1.5x, and a PRO spot that gets 1.2x. This is in addition to utility spots. Because NBA is a bit more narrow of a sport, this helps get away from ties with other players. This is by far the most unique single game type format going around the industry right now. FanDuel also introduced second half football slates to go a full step further. This has shrunk down the fantasy game to the furthest extent so far. There have been some revolving games over on FanDuel, but none of them have consistently stayed within the formats. There have been different game modes that change up the scoring. The Three Point Contest for NBA, which solely focused on three point scoring and nothing else. They also have added in a tiers style contest with no salary cap, and the ability to choose players from predetermined player pools. FanDuel brought back an old industry game where you had to beat the score. FanDuel would determine a set score, and those above it would split the prize. Your full roster format is what you have been either playing for years, or what they call the standard slate if you are new to the site. This is your basic salary cap format, where a user will need to fill-in each spot, all while staying under salary. This mode also contains late-swap, which is the ability to sub out a player with another player as long as both games have not started. The scoring is standard across all sports within this format, although the number of players within the lineup varies. 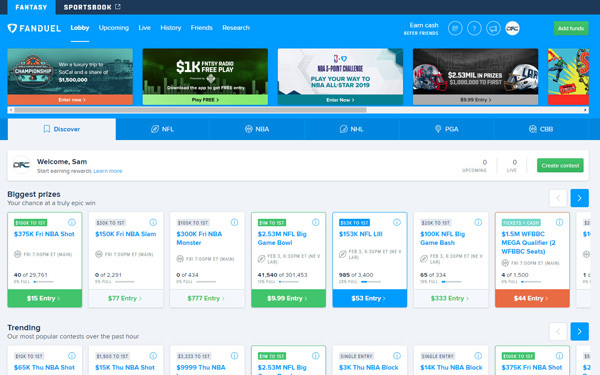 FanDuel has changed around their homepage from the older days, giving it a more extensive way of breaking down slates and formats. The discover page highlights the biggest prize pools, and also qualifiers for bigger contests at a later date. This tab also breaks up contests into single games and single entry tournaments. Moving into a specific sports tab, you are able to sort by game styles, and slate times. There is a slider to narrow down entry fee and types. With FanDuel moving to a novice, experienced, and highly experienced tags for users, you can see what game types exclude those types of players. The contest selections are wide on FanDuel, and whether you are steadily trying to double up your cash, or hit the home run winning a big tournament. Tournaments can also be called GPPs (Guaranteed Prize Pools). Cash games include head-to-head games, 50/50s, and double-ups. Tournaments have a lesser chance of cashing, but a higher chance of pay outs. You can also add in multipliers, satellites, and qualifiers to the tournaments list. Cash games will usually pay out 50% of the field, or very close to it. Tournaments will pay out 20-30%, although there are some winner take all tournaments. Single entry and three entry max tournaments have blossomed over the last year or so, and attempt to even the playing field to eliminate max entry players. You can find these tournaments in a number of entry fee ranges, and also across all sports. The standard full roster formats are pretty straight forward, and FanDuel does not differ much from what you would expect when setting a lineup. This past season they barely removed the kicker position from NFL lineups and switched it with a FLEX spot. For NBA and NHL they do not offer any sort of utility spot, which makes them different from other sites around the industry. They did change their baseball product a bit by adding a utility position, as well as combining the catcher and first base position into one player pool. FanDuel does not offer up any multi-position eligibility. For their PGA product they resemble a lot what DraftKings did at first, and have six golfer lineups to create while going under a salary cap. Drafting a team has been the same on FanDuel since they have opened. You have your set salary or rules to follow, and they make it sortable to help find players within the player pool. The new addition of Guru Suggestions is a way to help level the playing field for some. They narrow down the player pool for you, and each selection will adjust what they chose for you down the line. If you don't have time to study and breakdown all sorts of stats, this is a way to try and compete without doing all the work. Scoring on FanDuel is simplified compared to some of the other sites around the industry. There are no bonuses for going over a set amount of yards, nor are their double-double bonuses for NBA. Basketball has always had a late swap topic, and FanDuel went away from that adding the lowest score dropped rule. If a player gets scratched or doesn't do well, they will be dropped from your overall score. This goes the same for everyone. For baseball, they added a quality start bonus, which helps take some emphasis off the win, which is a step in the right direction. The baseball scoring is straight forward, moving up by three each base you hit for. In 2018, NBA moved to a different fantasy scoring making blocks and steals worth three points each. FanDuel was the only site to join with this, which puts a heavier weight on those two stats. Turnovers are also a heavily weighted stat being negative one, where they are less on a few other sites. For NHL contests, FanDuel has power play bonus, which is unique for their site. This is what it's all about. Scoring more points than your opponent or opponents and making real money. Contests such as 50/50s offer flat payouts to every gamer who finishes in the top half of the game, while tournaments and leagues have a tiered payout system depending on where you finish. The higher you finish, the more money you win in tournaments and leagues. All payouts listed are after having already accounted for taking a rake from all of the contestants. It's important to understand the payout structure for each game as they can be quite different even within the same game type. Many of the biggest prize pool tournaments will pay the winner a significantly higher percentage of the winnings than some of the smaller tournaments. Again, it's best to read the payout structure before entering games so that you understand the optimal strategy for that game type. Withdrawing is a breeze. In order to make a withdrawal you need to click on the down arrow located next to your username. You'll find a withdraw button to click on which will take you to the request withdrawal screen. 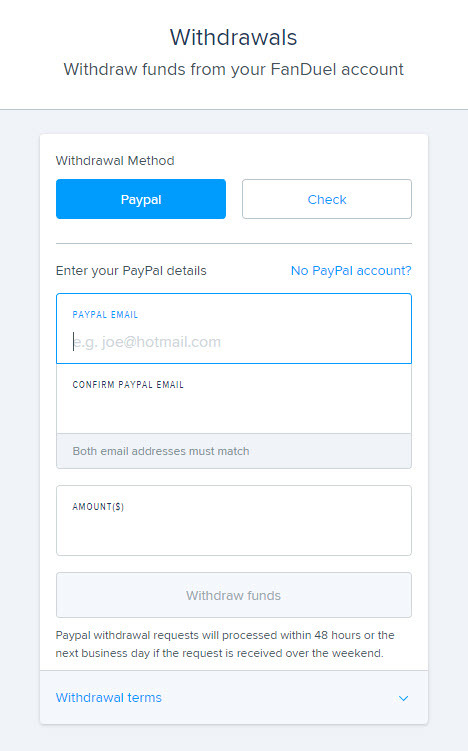 If you have a PayPal account, you can simply enter your PayPal email address and the dollar amount you'd like to withdraw. FDnotes withdrawal requests will be processed within 48 hours or the next business day if the request is received over the weekend. 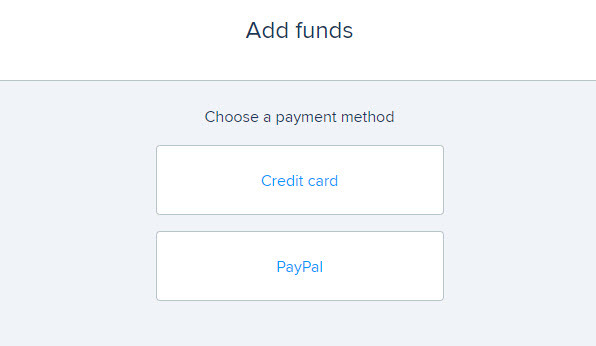 They also note that they may perform additional checks if the PayPal account you're withdrawing to is not the one used to initially deposit funds into your account. For those who don't have a PayPal account, or those who don't want to receive payment that way, checks are an available withdrawal method. On the check withdrawal screen you're prompted for your name, the requested withdrawal amount and your address. Check withdrawal requests will take approximately 7-10 business days. FD may request your mailing address and SSN before a withdrawal is processed for tax purposes. If your annual net winnings exceed $600, then FD is required to file a 1099-MISC tax form. FD is very serious about protecting their gamers, and they will conduct anti-fraud checks on playing patterns and deposits prior to processing all withdrawals. You can feel comfortable knowing that FD will make sure that it is you, and only you receive your funds. The desktop interface is clean and easy to navigate and supports virtually all machines. You can check out the lobby, upcoming contests, live contests and your history. The mobile site is easy to use and clutter free. You can check your contests, including the history, or you can toggle to enter a contest. There is also a drop down menu that allows you to do everything you could do on the desktop interface. Within the contests, you can click on player names and get a variety of statistics as well as the latest player news provided by RotoWire. Overall, it's a nice interface that's easy to use. The top navigation bar provides virtually of all the critical information you need to get started. The support page contains a FAQ, which is nice, but didn't answer the only question I had when I first started. I think a glossary would be helpful as I didn't know what a 50/50 game was. It means the top half of the entries are in the prize-pool and everyone wins the same amount. Overall, the site does a nice job of helping you find the information you need easily. Overall, the technology loads quickly and the usability features are easy to understand. I think the flow of information is intuitive and everything is pretty basic, which is the way game interfaces should be. You can easily sort the different columns of data and update the contests you'd like to see with easy to use checkbox filters. The drafting screen is simple and maybe a bit too simple. It would be nice if they integrated data tools with updated stats and projections. Even something simple like Yahoo's data projections would be nice. The technology is leagues ahead of some of the competition and on par with any other site online today. The FanDuel mobile app has improved drastically over the last few years, and is available on Android and Apple phones. The mobile app gives you control over your lineups, which includes building and editing. If you are looking to join contests on the fly, FanDuel has an easy format to navigate through various sports and contest styles. FanDuel introduced Friends Mode last year, and you can manage your friends league right from the app. Accessing your rewards and vouchers can be found right in your account tab. It is an easy navigation to work through your account features. If you are looking to add funds or withdraw funds, the mobile app allows you to do as such. Turning on notifications will keep you posted on promotions, and also news for your current or upcoming lineups. This is a great way to stay on top of information. FanDuel does a nice job with the contest section. I like the fact that a history is kept of all your competitions and you can see up to date scoring of your players and others in your league. You also have easy access to player profiles and can see the other people's winnings for the year. I recently lost to a player who had won over $300,000 during their time on the site. Maybe it's time to consider a new career? FanDuel has made some modifications to their rewards center, but have kept their FDP (FanDuel Points). Each contest with a money entry fee reimburses out FDP, which you accumulate. These can be used to enter other contests. You earn 5 FDP for every $1 you spend to enter a paid contest. FanDuel introduced the Players Club, and this gives you special rewards for those in the club. There are free play contest, and also more vouchers put into your account. These unlock contests, and can be found in your user account center. FDP do expire now, but you have a year to use them up. The reputation for support isn't that strong. It's important to be able to count on the site you're playing daily fantasy sports on, and FanDuel doesn't get the highest marks in that regard. You also don't have to jump through any hoops to locate how to contact them for support. Directly to the left of your username is a help drop down menu with a support button. On the support page you'll find FAQs for basic questions, deposits, withdrawals and bonuses, rules and scoring, and gameplay and opponents. If none of the FAQs answer what you need to know, there is a hyperlinked email for support or a submit support ticket button. It's also very easy to contact support using the mobile site. Overall, I'm thoroughly impressed with FD's desire to make contacting them so easy. Yes, it is legal due to the exception for Fantasy sports in the Unlawful Internet Gaming Enforcement Act. This law is basically one of the lamest things the US government has devised to try to prevent people from gambling online. However, in this law, it designates fantasy sports as a game of skill rather than a game of chance. In virtually every state, fantasy sports is also considered a game of skill, but as always there are few states that have questionable laws and Fanduel doesn't accept paid entry games from people in a number of states, so check our Legal page frequently for state updates. FanDuel Sportsbook is Open in New Jersey! FanDuel has partnered with the Meadowlands Racetrack in New Jersey and it's betting app has made a market splash. After one month FanDuel Sportsbook is the 2nd highest grossing online sportsbook in NJ. DraftKings Sportsbook is leading the way and had a head start. Paddy Power is seeing nice potential in the market and it's likely that sports betting will be the company's main focus in the near future. For a full review of FanDuel Sportsbook, visit Lineups.com. Lineups has full coverage of sportsbook with legal online sports betting in NJ. Since first opening for business in 2009, FD, has amassed more than 2 million customers. That's two percent of the overall fantasy sports base, indicating that the market's barely been tapped. The company's popularity has caught the attention of venture capital firms that have invested a total of $88 million into the company. The biggest catch so far has been the four-year agreement FD signed with the NBA, just months after the first individual agreement with one of the league's teams, the Orlando Magic. That status, which includes the league purchasing equity in FD, means it's the only daily fantasy site featured on NBA.com. FanDuel struck a deal with the NHL, as a daily fantasy sports partner and sports betting. FanDuel will now offer VIP experiences for their main events like the Winter Classic and All-Star Game. With New Jersey being a hub for sports betting and fantasy sports, FanDuel has a deal with the New Jersey Devils. Seven different NBA franchises have signed individual agreements: the Brooklyn Nets, Chicago Bulls, Cleveland Cavaliers, Dallas Mavericks, Los Angeles Lakers, New York Knicks and the aforementioned Magic. The deal with Orlando made FD the Magic's third-largest marketing partner, where they prominently serve as the floor apron sponsor. The contract is for one year (per NBA rules), but Orlando has options for the next two seasons, which could make the deal worth $6 million. With Chicago, FD receives signage at the United Center, along with a connection to a specific team statistic during each game that is posted on all Bulls' social media sites. In addition, the company sponsors a sweepstakes on the team website awarding winners Bulls merchandise. Dallas might be the least surprising addition to the team base, given the reputation of team owner Mark Cuban of venturing into new territories. Media exposure for the company is the main benefit, with a GM Fantasy Sweepstakes also in the mix. There, the winning fan will go behind the scenes with team general manager Donnie Nelson. The Brooklyn agreement makes FD an official team sponsor, and as part of the agreement, the company will purchase tickets to be given to qualifying local community organizations. In exchange, they will receive prominent exposure through arena signage, as well as additional mentions on television and radio broadcasts. While the Lakers are currently situated near the bottom of the NAB, they still reside in the Los Angeles market. That helps the official sponsorship that FD has purchased reach more people in this vast market. Cleveland's deal is the most recent, and follows in the footsteps of the other agreements, allowing for online mentions on the Cavaliers' website, as well as signage inside of Quicken Loans Arena. A social media component will offer a sweepstakes where fans can win merchandise. Perhaps the quietest partnership is with the Knicks, with little in the way of information offered by either side. However, given the current state of the team, that may be best for both sides. In the National Football League, the Washington Redskins are currently the lone team to have a partnership with FD. Despite the different sport, the agreement afford the company signage at FedEx Field during Redskin games, and also prominent mentions on social and digital media. More NFL teams will follow in the Redskins' footsteps, since Commissioner Roger Goodell is looking to more than double revenue in the next decade. One key component could be daily fantasy sports. What all of these deals do for FD in 2015 is create greater awareness, which should inevitably lead to more players being added every day. As already noted, the total market of regular fantasy players hasn't been reached, with other previously neglected segments also ripe for picking. Chief among them is the female demographic, which FD is avidly going after, since many women could be more willing to invest brief periods of time with it in lieu of a season-long commitment. Another year of rapid success could lay the groundwork for FD to go public in 2016. Success like that hasn't gone unnoticed by the market, which continues to expand, making this a business that won't fade any time soon. FanDuel is personally my favorite league. They seem to have the largest number of players, highest free bonus deposit match and the site is easy to use. I’m a newb and picked Fanduel, because they have the highest bonus match. So far, it’s been good. Thanks for the code! I have enjoyed using FanDuel. I started using DraftKings when I began playing weekly fantasy and FanDuel is very similar. The only knock I have against FanDuel as it compares to DraftKings is that I prefer the darker interface of DraftKings to the lighter screen on FanDuel. That is simply nitpicking, though. Just lost my StarStreet account with the DK merger and am not a fan of DK. Too many people in the contests and not a fan of their salaries. I was also a fan of DraftStreet, but now it’s just Fanduel and Draftkings. I’ll take FD and try to find another game to replace my favorite pick five. FD so far is a nice site. I’m just not a fan of the consolidation in the industry right now. We need more choices. Not sure why this site only features 5 sites when there are 15. The site is nice and easy to use, but there is clearly shenanigans when it comes to winning on this site. There is obviously bots at work. The real winner is fanduel they take in a lot of money and but pay virtually nothing out.